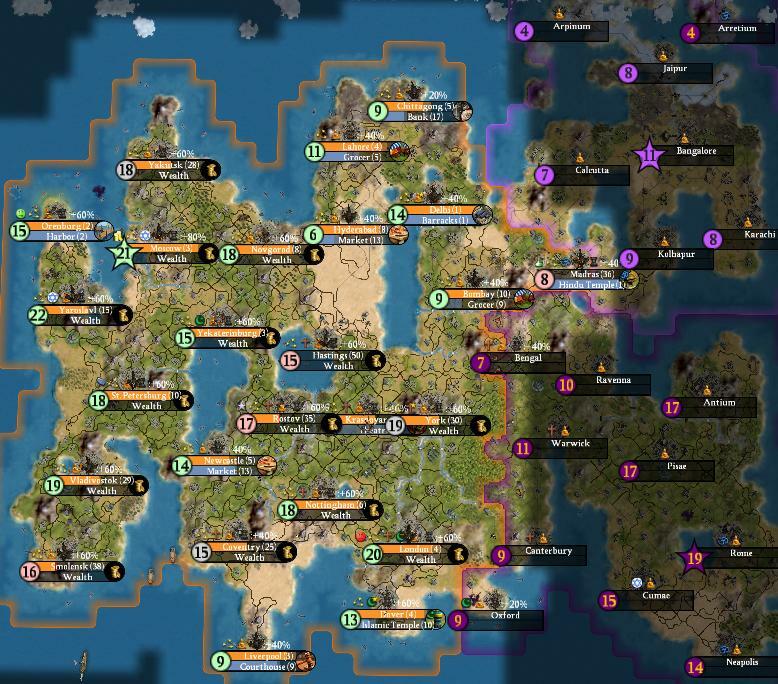 I had a healthy amount of land now, nicely improved for the most part because I had avoided to pillage much during my campaign against England, and built (and whipped) banks everywhere, which were one of the most valuable buildings for my variant, seeing that I ran 0% science and 0% culture most of the time. I had two faithful friends, Caesar and Gandhi, but that actually were one of my biggest problems as well. Gandhi was the most advanced leader on the planet, and was second in population and lands behind me. I had to stop him, and soon, even if we had pleased relations! I was also afraid that Saladin, who was Jewish and who was annoyed with me, would decide to attack me. I think my cossacks would be able to handle any landings he might try, but that wouldn't help my overall game. While thinking about what to do next, Saladin knocked on my door. Now that was nice! 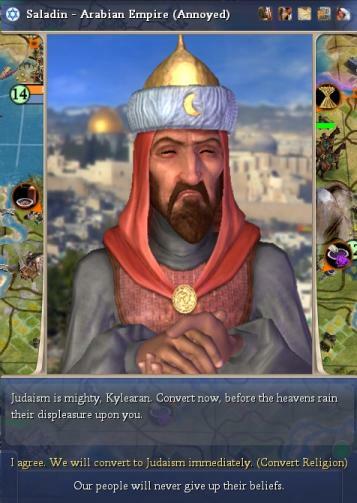 I didn't have any Jewish cities in my empire until only a few turns ago, when Judaism had spread to London, so I was finally able to convert - I complied with his demand, which raised relations between us immediately. With Caesar I still had good relations despite now being of a different faith (he still was Buddhist), thanks to our mutual military struggle and good trading relationships. Only relations with Gandhi sank to the bottom rapidly, but then I had to attack him rather sooner than later anyway, seeing that he already had infantry and artillery. So while I built more and more cossacks and moved them towards Gandhi's borders, I bought Democracy from my new friend, Saladin, for 6970 gold, and finally adopted emancipation. Are 6970 gold worth five happiness? I think so! It was the year 1806AD, and I still ran Paganism and Decentralization. Decentralization because I had no real alternative yet, and Paganism because it had only a low upkeep. Organized religion and pacifism weren't really helpful, now that I mainly built cossacks, catapults, and musketmen. 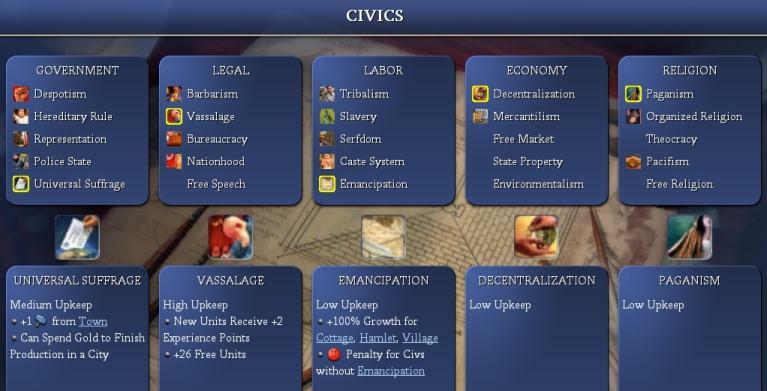 I would have liked to adopt Theocracy, but had no money to afford the necessary tech. 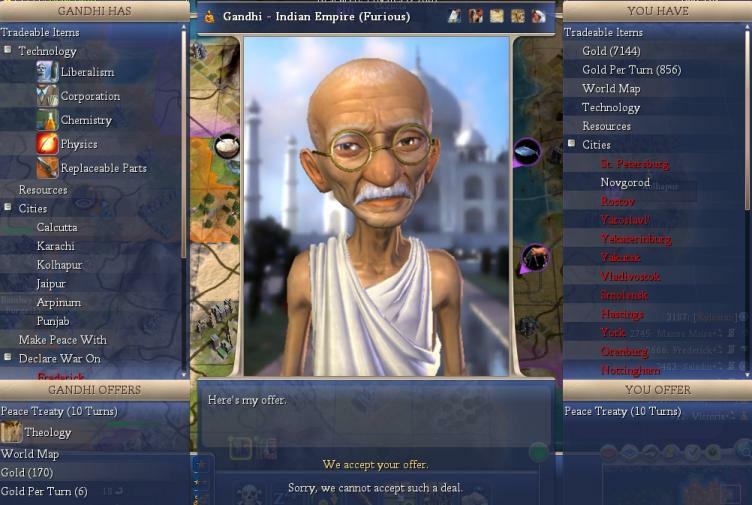 Unfortunately, relations with Gandhi dropped faster than I had anticipated, and he stopped to trade me horses in 1812AD. Ouch! 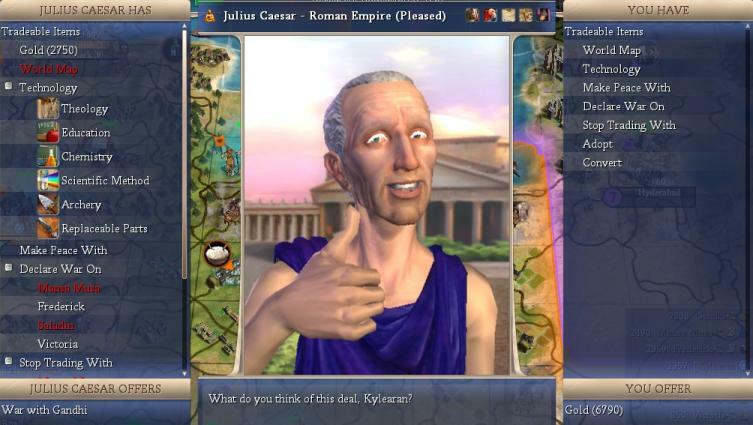 But a few turns later, Rome had some spare horses, so I made this trade with my best buddy Caesar. I had learned my lessons from the last war, and used the few remaining turns I had open borders with Gandhi to scout his lands. I didn't like what I saw: Infantry, SAM infantry, artillery, and marines were guarding his cities, and in no small quantities! Also, destroyers and transports were roaming the seas. I, on the other hand, still only had cossacks, musketmen, catapults, and caravels. While it might be possible to stand up against Gandhi with superior numbers, I'd really liked for him to spend his extra troops first before I threw everything I had against him. The problem though was that Caesar was still at war with England, somehow unable to eliminate Victoria. And while an AI is at war, you cannot pay him to wage another war against another civ - quite intelligent, I must say. So for the first time in my Civ 4 career, I paid an AI to make peace, and with no small a sum! So after waiting a few more turns to be sure his units were busy elsewhere, I declared war on Gandhi in 1834AD. I also paid Saladin 2890 gold to declare on him too, hoping he might be able to stop Gandhi from pillaging all my sea resources. But that never happened, and I lost all my sea resources during the war, about 15 or so - ah well. During that turn, Victoria declared war on me! Argh. Since none of her forces could be seen, I guess Gandhi had bribed her. I didn't fear her (and in fact didn't see a single unit from her throughout the war), but war weariness immediately shot up to high levels again, and I had to run 40% culture even before firing a single shot. That was very frustrating! I think it would be much better if war weariness wouldn't kick in immediately if someone declares war on you, it should do so only if you fight outside your borders for the first time, or if you are the one who declares wae. I had experienced this situation several times now, and it is really annoying, because you cannot do anything to prevent it and have to suffer it for a long time because the AIs won't talk to you. I really, really should have captured that one last city of hers I hadn't seen during the last war. This mistake cost me a lot of money now! Anyway, back to the game. 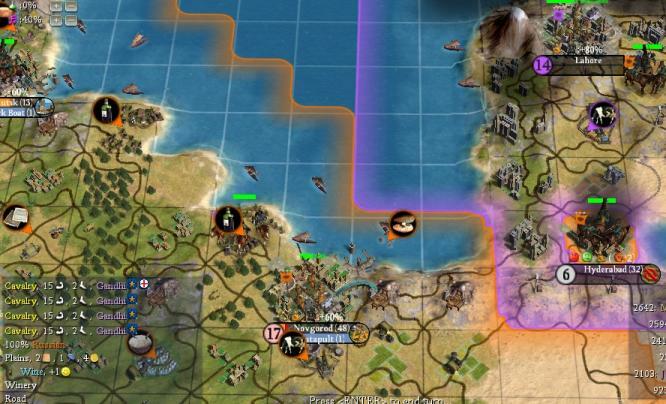 After removing Bombay's defenses, I sent in 5(!) suicide catapults, four of them dying. 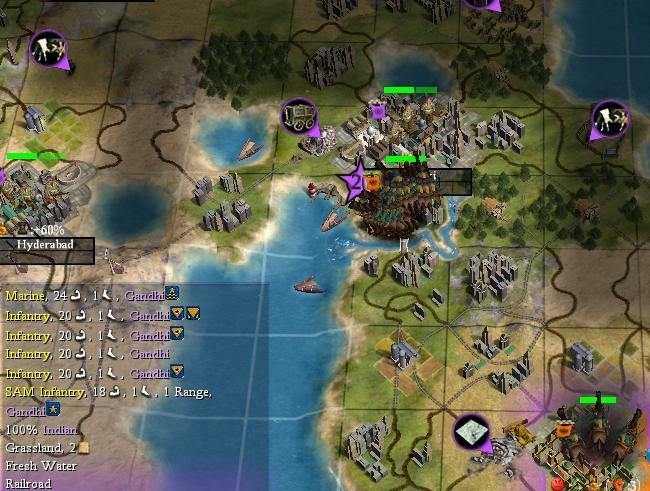 This brought the strength of the defenders down to the level of my cossacks, and I lost only one taking the city. Catapults against infantry, yay! After healing, I advanced on Delhi. Again, I was quite surprised how weakly defended it was. I had to produce a lot of new catapults to replace my losses, but I definately had fun fighting this kind of uphill battle! Of course India wasn't defeated yet. Next, they landed a small stack near Novgorod I didn't see coming. Ugh...the city was only defended by a musketman, an axeman, and a warrior(!). Luckily for me though, it was on the way of my reinforcement cossacks to the front, so I could move two cossacks into the city and attack out of it, killing one cavalry (and losing one cossack). Next turn, only two cavalry attacked the city while the other moved away to pillage, so all in all I only lost a cossack and a winery by this landing. 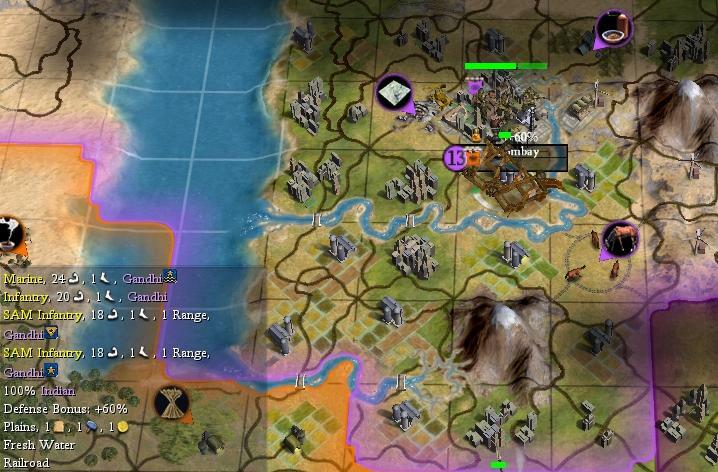 As the screenshot shows, I had already captured Hyderabad at that time, and Lahore and Chittagong fell next. Besides city garrisons, I met only small resistance, as all of Gandhi's troops seemed to be busy with Rome, or dead, so I guess the huge amount of money I had paid Rome, first for peace with England, then to fight Gandhi, had been well worth it! How often do you see this? Catapult action and spaceship building on the same turn? So as you can see, Mansa Musa was in the space race as well. Meanwhile, I relished the throw-away society - 5 to 6 catapults were thrown away per city, and quicky replaced by my highly productive cities. During the war, I had bought Education for 4030g and Economics for a mere 3130g (why so cheap? I have no idea! ), and finally left decentralization and adopted free markets in 1856AD(!). Yay me! I had also made peace with Victoria again, getting Archery and her maps for nothing, but war weariness from fighting Gandhi was very high now. Not only did my people complain about the war, +13 in my capital!, they also didn't like fighting their brothers and sisters of the faith. While my state religion was Judaism, my citizens were still Buddhists in their hearts it seems. So when Madras was mine, and I got tired of all this micromanaging my military units (something that happens quite frequently to me in non-tournament games), I made peace with Gandhi again. I rebuilt all my fishing boats and integrated my new cities into my empire, and also enjoyed my first railroads (without even knowing what	coal was!) and lumbermills (without having Replacable Parts...).